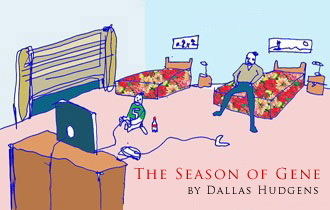 Okay true it’s summer, and the Stanley Cup is firmly in Penguin hands till next year, but we got one more hockey story for you, some new fiction from Dallas Hudgens – the tale of a down on his luck semi-pro from Ontario who never quite learned his half and whole steps on the piano is battling to keep it together, at turns giving piano lessons to a young lady, stocking shelves in a Rite AID, while hallucinating the horrors of his father and body checking everyone who might breathe at him funny. 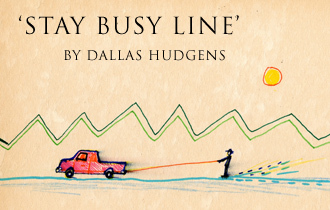 Meet Serge in ‘Stay Busy Line.’ Art by Danny Jock. 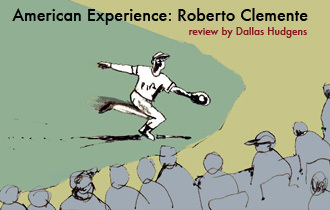 Pittsburgh Pirates right fielder Roberto Clemente had a laser arm, a champion’s career, a humanitarian’s way, and a tragic end to his life in heroic fashion. Dallas Hudgens, author of the recent novel Season of Gene, explores the man’s life through the lens on the new special on PBS’ American Experience that premieres this Monday the 21st of April. Drawing by Danny Jock. Dallas Hudgens, FANZINE regular and author of the rollicking Drive Like Hell, returns with another novel for sports fans and literati alike, The Season of Gene (available now). Here’s an excerpt (Chapter 20 in fact) of this tale of beer league baseball, mobsters and gamers, pain pills, lost love and lifted lids. Illustrations by Danny Jock. This April marks the 60th anniversary of Jackie Robinson’s historic debut in Major League Baseball. 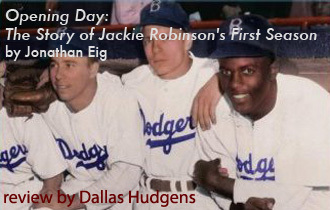 Dallas Hudgens reviews Jonanthan Eig’s account of Robinson’s Opening Day. 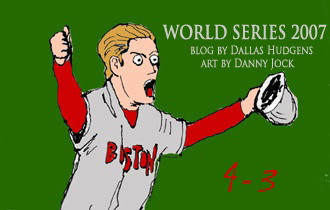 (Are we jinxing the Mets by putting this up?) 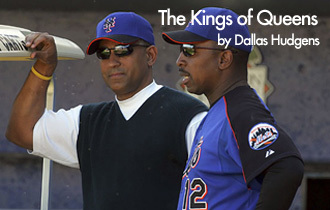 While the defeated Yankees brain trust shudders beneath the hand of King George, the Mets are in good hands with General Manager Omar Minaya and manager Willie Randolph at the helm. Why didn’t a baseball owner recognize the talents of these two men a lot sooner? There are those schools that nobody ever hears about because, well, even if they have a sports team, they have never made it to any of the big dances. 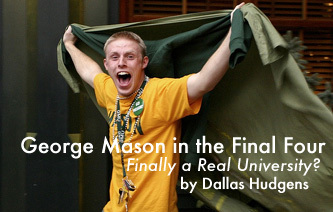 George Mason Alumnus Dallas Hudgens writes about the wild ride it has been for The Patriots this season, making it to the Final Four of the NCAA Championship, a feat that has put this rather unkown school on the map.